question_answer1) In a Mathematics test, the following marks were obtained by 40 students. Arrange these marks in a table using tally marks. (a) Find how many students obtained marks equal to or more than 7. (b) How many students obtained marks below 4? 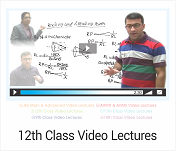 TIPS Firstly, write the marks in ascending order i.e. 1, 2, ..., 9 in first column of table. In second column, using tally marks represent number of students having corresponding marks and in third column write the number of students. question_answer2) Following is the choice of sweets for 30 students of class VI. Ladoo, Barfi, Ladoo, Jalebi, Ladoo, Rasgulla, Jalebi, Ladoo, Barfi, Rasgulla, Ladoo, Jalebi, Jalebi, Rasgulla, Ladoo, Rasgulla, Jalebi, Ladoo, Rasgulla, Ladoo, Ladoo, Barfi, Rasgulla, Rasgulla, Jalebi, Rasgulla, Ladoo, Rasgulla, Jalebi, and Ladoo. (a) Arrange the names of sweets in a table using tally marks. (b) Which sweet is preferred by most of the students? TIPS Write the name of sweets in first column, then in second column use tally marks to represent number of students like corresponding sweet and in third column write the number of students. Make a table and enter the data using tally marks. Find the number that appeared. (a) the minimum number of times. (b) the maximum number of times. (c) Find those numbers that appear an equal number of times. 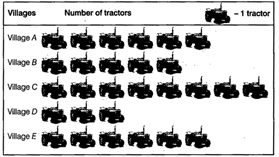 question_answer4) Following pictograph shows the number of tractors in five villages. Observe the pictograph and answer the following questions. (i) Which village has the minimum number of tractors? (ii) Which village has the maximum number of tractors? (iii) How many more tractors village C has as compared to village B? (iv) What is the total number of tractors in all the five villages? 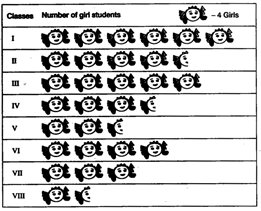 question_answer5) The number of girl students in each class of a co-educational middle school is depicted by the pictograph. Observe this pictograph and answer the following questions. 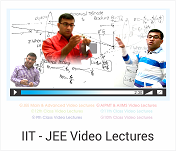 (a) Which class has the minimum number of girl students? (b) Is the number of girls in Class VI less than the number of girls in Class V? (c) How many girls are there in Class VII? question_answer6) The sale of electric bulbs on different days of a week is shown below Observe the pictograph and answer the following questions. (a) How many bulbs were sold on Friday? 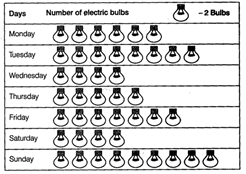 (b) On which day were the maximum number of bulbs sold? (c) On which of the days same number of bulbs were sold? (d) On which of the days minimum number of bulbs were sold? (e) If one big carton can hold 9 bulbs. How many cartons were needed in the given week? 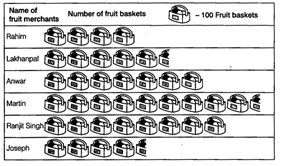 question_answer7) In a village six fruit merchants sold the following number of fruit baskets in a particular season. Observe this pictograph and answer the following questions. (a) Which merchant sold the maximum number of baskets? (b) How many fruit baskets were sold by Anwar? (c) The merchants who have sold 600 or more number of baskets are planning to buy a go down for the next season. Can you name them? Prepare a pictograph of these animals using one symbol \[\otimes \] to represent 10 animals and answer the following questions. (a) How many symbols represent animals of village E? (b) Which village has the maximum number of animals? (c) Which village has more animals: village A or village C? question_answer9) Total number of students of a school in different years is shown in the following table. A Prepare a pictograph of students using one symbol 9 to represent 100 students and answer the following questions. (a) How many symbols represent total number of students in the year 2002? (b) How many symbols represent total number of students in the year 1998? B. Prepare another pictograph of students using any other symbol each representing 50 students. Which pictograph do you find more informative? 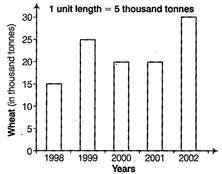 question_answer10) The bar graph given below shows the amount of wheat purchased by government during the year 1998-2002. Read the bar graph and write down your observations. In which year was (a) the wheat production maximum? (b) the wheat production minimum? question_answer11) Observe this bar graph, which is showing the sale of shirts in a ready made shop from Monday to Saturday. Now, answer the following questions. (a) What information does the above bar graph give? (b) What is the scale chosen on the horizontal line representing number of shirts? (c) On which day were the maximum number of shirts sold? How many shirts were sold on that day? (d) On which day were the minimum number of shirts sold? (e) How many shirts were sold on Thursday? 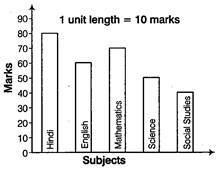 question_answer12) Observe this bar graph which shows the marks obtained by Aziz in half-yearly examination in different subjects. Answer the given questions. (a) What information does the bar graph give? (b) Name the subject, in which Aziz scored maximum marks. 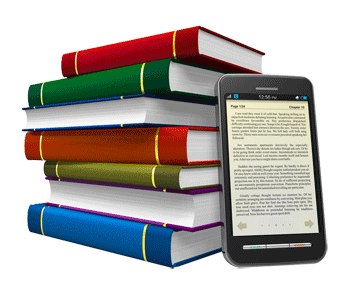 (c) Name the subject, in which he has scored minimum marks. (d) State the name of subjects and marks obtained in each of them. question_answer13) A survey of 120 school students was done to find which activity they prefer to do in their free time. Draw a bar graph to illustrate the above data taking scale of 1 unit length = 5 students. Which activity is preferred by most of the students other than playing? Draw a bar graph to represent the above information choosing the scale of your choice. question_answer15) Following table shows the number of bicycles manufactured in a factory during the years 1998 to 2002. Illustrate this data using a bar graph. Choose a scale of your choice. (a) In which year were the maximum number of bicycles manufactured? (b) In which year were the minimum number of bicycles manufactured? Draw a bar graph to represent the above information and answer the following questions, (take 1 unit length = 20 thousands) (a) Which two age groups have same population? (b) All persons in the age group of 60 and above are called senior citizens. How many senior citizens are there in the town?